Ukrainian military target satellite. In 1969 KB Yuzhnoye introduced targets for exercise and test of PVO air defense and space tracking systems. Radar calibration satellite built by Yuzhnoye, Russia. Launched 1976 - 1995. Used AUOS-3 bus. AKA: 17F31;Romb;Yug. Status: Operational 1976. First Launch: 1976-04-28. Last Launch: 1995-03-02. Number: 31 . Height: 2.00 m (6.50 ft). Span: 2.00 m (6.50 ft). The second generation consisted of Taifun-1 and Taifun-2 radar calibration satellites, which differed in the type of equipment installed. In 1972 KB-3 under B E Khimrov, with the co-operation of assisting organizations and the Ministry of Defense, completed the draft project. The first Taifun-2 was completed in 1976. Flight trials were conducted in the second half of the 1970's using Kosmos-3M launch vehicles from Plesetsk and Kapustin Yar. The heads of the State Trials Commission were B N Karpov, N N Zhukov, and B G Zudin. The system was accepted into military service on 12 March 1981 after 11 launches. Taifun-2 satellites were spherical in shape, 2 m in diameter, with no external solar cells or antennae. Taifun-2 normally released 25 Romb subsatellites into an orbit of 300 to 500 km altitude, at inclinations of 50.7 degrees (from Kapustin Yar) and 65.9 74, or 82.9 degrees (from Plesetsk). Two unique missions in 1989-1990 were put into 180 km x 1550 km orbits at 65.8 degrees. With this higher apogee the payload was reduced to 10 Romb subsatellites. Family: Military, Military target sat, Surveillance. Country: Ukraine. Launch Vehicles: R-14, Kosmos 3, Tsiklon, Kosmos 11K65M, Tsiklon-3. Launch Sites: Kapustin Yar, Plesetsk, Plesetsk LC132/2, Plesetsk LC132/1, Kapustin Yar LC107/1, Plesetsk LC32. Agency: MO, Yuzhnoye. Bibliography: 102, 2, 445, 474, 6, 13254, 13255, 13256. 1971 October 1 - . Taifun-2 development approved. - . Nation: Russia. Spacecraft Bus: AUOS. Spacecraft: Taifun-2. Decree 'On the Development of an Adjustment Complex with the Taifun-2' Artificial Satellite--approval of work on the Taifun-2 system' was issued..
1976 April 28 - . 13:30 GMT - . Launch Site: Plesetsk. Launch Complex: Plesetsk LC132/1. LV Family: R-14. Launch Vehicle: Kosmos 11K65M. Cosmos 816 - . Mass: 950 kg (2,090 lb). Nation: Russia. Agency: MO. Class: Surveillance. Type: Radar calibration target. Spacecraft Bus: AUOS. Spacecraft: Taifun-2. Decay Date: 1979-11-24 . USAF Sat Cat: 8812 . COSPAR: 1976-037A. Apogee: 566 km (351 mi). Perigee: 453 km (281 mi). Inclination: 65.90 deg. Period: 94.80 min. Released 24 Romb radar calibration subsatellites..
1976 December 17 - . 12:00 GMT - . Launch Site: Plesetsk. Launch Complex: Plesetsk LC132/2. LV Family: R-14. Launch Vehicle: Kosmos 11K65M. Cosmos 885 - . Mass: 900 kg (1,980 lb). Nation: Russia. Agency: MO. Class: Surveillance. Type: Radar calibration target. Spacecraft Bus: AUOS. Spacecraft: Taifun-2. Decay Date: 1979-10-14 . USAF Sat Cat: 9615 . COSPAR: 1976-124A. Apogee: 520 km (320 mi). Perigee: 433 km (269 mi). Inclination: 65.90 deg. Period: 94.10 min. Released 18 Romb radar calibration subsatellites..
1977 April 27 - . 03:30 GMT - . Launch Site: Kapustin Yar. Launch Complex: Kapustin Yar LC107/1. LV Family: R-14. Launch Vehicle: Kosmos 11K65M. Cosmos 906 - . Mass: 550 kg (1,210 lb). Nation: Russia. Agency: MO. Class: Surveillance. Type: Radar calibration target. Spacecraft Bus: AUOS. Spacecraft: Taifun-2. Decay Date: 1980-03-23 . USAF Sat Cat: 9938 . COSPAR: 1977-031A. Apogee: 515 km (320 mi). Perigee: 464 km (288 mi). Inclination: 50.60 deg. Period: 94.40 min. Released 1 Romb radar calibration subsatellite. Possible partially failed spacecraft bus..
1977 May 30 - . 22:30 GMT - . Launch Site: Plesetsk. Launch Complex: Plesetsk LC132/1. LV Family: R-14. Launch Vehicle: Kosmos 11K65M. Cosmos 913 - . Mass: 550 kg (1,210 lb). Nation: Russia. Agency: MO. Class: Surveillance. Type: Radar calibration target. Spacecraft Bus: AUOS. Spacecraft: Taifun-2. Decay Date: 1979-12-29 . USAF Sat Cat: 10028 . COSPAR: 1977-042A. Apogee: 520 km (320 mi). Perigee: 474 km (294 mi). Inclination: 74.00 deg. Period: 94.50 min. Released 21 Romb radar calibration subsatellites..
1977 December 8 - . 11:00 GMT - . Launch Site: Plesetsk. Launch Complex: Plesetsk LC132/2. LV Family: R-14. Launch Vehicle: Kosmos 11K65M. Cosmos 965 - . Mass: 550 kg (1,210 lb). Nation: Russia. Agency: MO. Class: Surveillance. Type: Radar calibration target. Spacecraft Bus: AUOS. Spacecraft: Taifun-2. Decay Date: 1979-12-16 . USAF Sat Cat: 10501 . COSPAR: 1977-111A. Apogee: 516 km (320 mi). Perigee: 465 km (288 mi). Inclination: 74.00 deg. Period: 94.40 min. Released 24 Romb radar calibration subsatellites..
1978 December 22 - . 22:00 GMT - . Launch Site: Kapustin Yar. Launch Complex: Kapustin Yar LC107/1. LV Family: R-14. Launch Vehicle: Kosmos 11K65M. Cosmos 1065 - . Mass: 1,170 kg (2,570 lb). Nation: Russia. Agency: MO. Class: Surveillance. Type: Radar calibration target. Spacecraft Bus: AUOS. Spacecraft: Taifun-2. Decay Date: 1979-08-01 . USAF Sat Cat: 11163 . COSPAR: 1978-120A. Apogee: 544 km (338 mi). Perigee: 348 km (216 mi). Inclination: 50.60 deg. Period: 93.50 min. Radar calibration. Released 7 Romb radar calibration subsatellites. Possible partially failed spacecraft bus..
1979 July 6 - . 08:20 GMT - . Launch Site: Kapustin Yar. Launch Complex: Kapustin Yar LC107/1. LV Family: R-14. Launch Vehicle: Kosmos 11K65M. Cosmos 1112 - . Mass: 1,190 kg (2,620 lb). Nation: Russia. Agency: MO. Class: Surveillance. Type: Radar calibration target. Spacecraft Bus: AUOS. Spacecraft: Taifun-2. Decay Date: 1980-01-21 . USAF Sat Cat: 11443 . COSPAR: 1979-063A. Apogee: 541 km (336 mi). Perigee: 357 km (221 mi). Inclination: 50.60 deg. Period: 93.50 min. Radar calibration. Released 25 Romb radar calibration subsatellites..
1980 June 6 - . 11:00 GMT - . Launch Site: Plesetsk. Launch Complex: Plesetsk LC132/1. LV Family: R-14. Launch Vehicle: Kosmos 11K65M. Cosmos 1186 - . Mass: 900 kg (1,980 lb). Nation: Russia. Agency: MO. Class: Surveillance. Type: Radar calibration target. Spacecraft Bus: AUOS. Spacecraft: Taifun-2. Decay Date: 1982-01-01 . USAF Sat Cat: 11829 . COSPAR: 1980-047A. Apogee: 414 km (257 mi). Perigee: 388 km (241 mi). Inclination: 74.00 deg. Period: 92.60 min. Released 25 Romb radar calibration subsatellites..
1980 July 31 - . 10:20 GMT - . Launch Site: Kapustin Yar. Launch Complex: Kapustin Yar LC107/1. LV Family: R-14. Launch Vehicle: Kosmos 11K65M. Cosmos 1204 - . Mass: 900 kg (1,980 lb). Nation: Russia. Agency: MO. Class: Surveillance. Type: Radar calibration target. Spacecraft Bus: AUOS. Spacecraft: Taifun-2. Decay Date: 1981-02-23 . USAF Sat Cat: 11917 . COSPAR: 1980-067A. Apogee: 546 km (339 mi). Perigee: 349 km (216 mi). Inclination: 50.70 deg. Period: 93.50 min. Radar calibration. Released 25 Romb radar calibration subsatellites..
1981 September 28 - . 21:00 GMT - . Launch Site: Plesetsk. Launch Complex: Plesetsk LC132/2. LV Family: R-14. Launch Vehicle: Kosmos 11K65M. Cosmos 1311 - . Nation: Russia. Agency: MO. Class: Surveillance. Type: Radar calibration target. Spacecraft Bus: AUOS. Spacecraft: Taifun-2. Decay Date: 1983-08-28 . USAF Sat Cat: 12871 . COSPAR: 1981-097A. Apogee: 513 km (318 mi). Perigee: 462 km (287 mi). Inclination: 82.90 deg. Period: 94.30 min. Released 25 Romb radar calibration subsatellites..
1982 January 29 - . 11:00 GMT - . Launch Site: Plesetsk. Launch Complex: Plesetsk LC132/1. LV Family: R-14. Launch Vehicle: Kosmos 11K65M. Cosmos 1335 - . Mass: 550 kg (1,210 lb). Nation: Russia. Agency: MO. Class: Surveillance. Type: Radar calibration target. Spacecraft Bus: AUOS. Spacecraft: Taifun-2. Decay Date: 1987-04-05 . USAF Sat Cat: 13042 . COSPAR: 1982-007A. Apogee: 513 km (318 mi). Perigee: 476 km (295 mi). Inclination: 74.10 deg. Period: 94.50 min. Radar calibration; replaced Cosmos 1186. Released 25 Romb radar calibration subsatellites..
1982 March 4 - . Launch Site: Kapustin Yar. Launch Complex: Kapustin Yar LC107/1. LV Family: R-14. Launch Vehicle: Kosmos 11K65M. FAILURE: Launch vehicle failed to orbit - unknown cause.. Failed Stage: U.
Romb - . Nation: Russia. Agency: UNKS. Class: Surveillance. Type: Radar calibration target. Spacecraft Bus: AUOS. Spacecraft: Taifun-2. Released 25 Romb radar calibration subsatellites..
1982 April 21 - . 01:40 GMT - . Launch Site: Kapustin Yar. Launch Complex: Kapustin Yar LC107/1. LV Family: R-14. Launch Vehicle: Kosmos 11K65M. Cosmos 1351 - . Mass: 550 kg (1,210 lb). Nation: Russia. Agency: MO. Class: Surveillance. Type: Radar calibration target. Spacecraft Bus: AUOS. Spacecraft: Taifun-2. Decay Date: 1983-03-14 . USAF Sat Cat: 13142 . COSPAR: 1982-034A. Apogee: 548 km (340 mi). Perigee: 348 km (216 mi). Inclination: 50.70 deg. Period: 93.60 min. Released 25 Romb radar calibration subsatellites..
1982 July 29 - . 19:40 GMT - . Launch Site: Kapustin Yar. Launch Complex: Kapustin Yar LC107/1. LV Family: R-14. Launch Vehicle: Kosmos 11K65M. Cosmos 1397 - . Mass: 550 kg (1,210 lb). Nation: Russia. Agency: MO. Class: Surveillance. Type: Radar calibration target. Spacecraft Bus: AUOS. Spacecraft: Taifun-2. Decay Date: 1983-05-18 . USAF Sat Cat: 13394 . COSPAR: 1982-076A. Apogee: 539 km (334 mi). Perigee: 343 km (213 mi). Inclination: 50.70 deg. Period: 93.40 min. Released 25 Romb radar calibration subsatellites..
1983 January 25 - . Launch Site: Plesetsk. Launch Complex: Plesetsk LC132/2. LV Family: R-14. Launch Vehicle: Kosmos 11K65M. FAILURE: Launch vehicle failed to orbit - unknown cause.. Failed Stage: U.
Romb - . Nation: Russia. Agency: UNKS. Class: Surveillance. Type: Radar calibration target. Spacecraft Bus: AUOS. Spacecraft: Taifun-2. Carried Romb radar calibration subsatellites..
1983 April 19 - . 12:00 GMT - . Launch Site: Plesetsk. Launch Complex: Plesetsk LC132/2. LV Family: R-14. Launch Vehicle: Kosmos 11K65M. Cosmos 1453 - . Mass: 550 kg (1,210 lb). Nation: Russia. Agency: MO. Class: Surveillance. Type: Radar calibration target. Spacecraft Bus: AUOS. Spacecraft: Taifun-2. Decay Date: 1989-05-08 . USAF Sat Cat: 14006 . COSPAR: 1983-034A. Apogee: 466 km (289 mi). Perigee: 434 km (269 mi). Inclination: 74.00 deg. Period: 93.60 min. Released 25 Romb radar calibration subsatellites..
1983 May 26 - . 05:00 GMT - . Launch Site: Kapustin Yar. Launch Complex: Kapustin Yar LC107/1. LV Family: R-14. Launch Vehicle: Kosmos 11K65M. Cosmos 1465 - . Mass: 550 kg (1,210 lb). Nation: Russia. Agency: MO. Class: Surveillance. Type: Radar calibration target. Spacecraft Bus: AUOS. Spacecraft: Taifun-2. Decay Date: 1985-01-23 . USAF Sat Cat: 14087 . COSPAR: 1983-049A. Apogee: 541 km (336 mi). Perigee: 349 km (216 mi). Inclination: 50.70 deg. Period: 93.50 min. Released 25 Romb radar calibration subsatellites..
1983 August 31 - . 06:30 GMT - . Launch Site: Kapustin Yar. Launch Complex: Kapustin Yar LC107/1. LV Family: R-14. Launch Vehicle: Kosmos 11K65M. Cosmos 1494 - . Mass: 550 kg (1,210 lb). Nation: Russia. Agency: MO. Class: Surveillance. Type: Radar calibration target. Spacecraft Bus: AUOS. Spacecraft: Taifun-2. Decay Date: 1985-09-26 . USAF Sat Cat: 14316 . COSPAR: 1983-091A. Apogee: 413 km (256 mi). Perigee: 309 km (192 mi). Inclination: 50.70 deg. Period: 91.80 min. Released 25 Romb radar calibration subsatellites..
1983 September 30 - . 11:00 GMT - . Launch Site: Plesetsk. Launch Complex: Plesetsk LC132/1. LV Family: R-14. Launch Vehicle: Kosmos 11K65M. Cosmos 1501 - . Nation: Russia. Agency: MO. Class: Surveillance. Type: Radar calibration target. Spacecraft Bus: AUOS. Spacecraft: Taifun-2. Decay Date: 1989-05-26 . USAF Sat Cat: 14380 . COSPAR: 1983-101A. Apogee: 472 km (293 mi). Perigee: 437 km (271 mi). Inclination: 82.90 deg. Period: 93.70 min. Released 25 Romb radar calibration subsatellites..
1984 September 27 - . 09:30 GMT - . Launch Site: Plesetsk. Launch Complex: Plesetsk LC132/2. LV Family: R-14. Launch Vehicle: Kosmos 11K65M. Cosmos 1601 - . Nation: Russia. Agency: MO. Class: Surveillance. Type: Radar calibration target. Spacecraft Bus: AUOS. Spacecraft: Taifun-2. Decay Date: 1989-11-29 . USAF Sat Cat: 15326 . COSPAR: 1984-104A. Apogee: 414 km (257 mi). Perigee: 387 km (240 mi). Inclination: 65.80 deg. Period: 92.60 min. Released 25 Romb radar calibration subsatellites..
1985 June 19 - . 11:30 GMT - . Launch Site: Plesetsk. Launch Complex: Plesetsk LC132/2. LV Family: R-14. Launch Vehicle: Kosmos 11K65M. Cosmos 1662 - . Nation: Russia. Agency: MO. Class: Surveillance. Type: Radar calibration target. Spacecraft Bus: AUOS. Spacecraft: Taifun-2. Decay Date: 1989-11-16 . USAF Sat Cat: 15833 . COSPAR: 1985-050A. Apogee: 410 km (250 mi). Perigee: 386 km (239 mi). Inclination: 65.80 deg. Period: 92.50 min. Released 25 Romb radar calibration subsatellites..
1985 October 2 - . 06:00 GMT - . Launch Site: Kapustin Yar. Launch Complex: Kapustin Yar LC107/1. Launch Pad: LC107/pad?. LV Family: R-14. Launch Vehicle: Kosmos 11K65M. Cosmos 1688 - . Mass: 550 kg (1,210 lb). Nation: Russia. Agency: MO. Class: Surveillance. Type: Radar calibration target. Spacecraft Bus: AUOS. Spacecraft: Taifun-2. Decay Date: 1988-07-02 . USAF Sat Cat: 16107 . COSPAR: 1985-089A. Apogee: 434 km (269 mi). Perigee: 320 km (190 mi). Inclination: 50.70 deg. Period: 92.10 min. Released 25 Romb radar calibration subsatellites..
1986 September 3 - . 09:00 GMT - . Launch Site: Plesetsk. Launch Complex: Plesetsk LC132/1. LV Family: R-14. Launch Vehicle: Kosmos 11K65M. Cosmos 1776 - . Mass: 700 kg (1,540 lb). Nation: Russia. Agency: MO. Class: Surveillance. Type: Radar calibration target. Spacecraft Bus: AUOS. Spacecraft: Taifun-2. Decay Date: 1989-12-15 . USAF Sat Cat: 16928 . COSPAR: 1986-067A. Apogee: 417 km (259 mi). Perigee: 403 km (250 mi). Inclination: 74.00 deg. Period: 92.80 min. Released 25 Romb radar calibration subsatellites..
1987 January 22 - . 07:00 GMT - . Launch Site: Kapustin Yar. Launch Complex: Kapustin Yar LC107/1. LV Family: R-14. Launch Vehicle: Kosmos 11K65M. Cosmos 1815 - . Mass: 700 kg (1,540 lb). Nation: Russia. Agency: MO. Class: Surveillance. Type: Radar calibration target. Spacecraft Bus: AUOS. Spacecraft: Taifun-2. Decay Date: 1988-11-15 . USAF Sat Cat: 17326 . COSPAR: 1987-007A. Apogee: 507 km (315 mi). Perigee: 336 km (208 mi). Inclination: 50.70 deg. Period: 93.00 min. Released 25 Romb radar calibration subsatellites..
1988 July 28 - . 11:20 GMT - . Launch Site: Plesetsk. Launch Complex: Plesetsk LC132/1. LV Family: R-14. Launch Vehicle: Kosmos 11K65M. Cosmos 1960 - . Nation: Russia. Agency: MO. Class: Surveillance. Type: Radar calibration target. Spacecraft Bus: AUOS. Spacecraft: Taifun-2. Decay Date: 1990-04-09 . USAF Sat Cat: 19338 . COSPAR: 1988-065A. Apogee: 379 km (235 mi). Perigee: 369 km (229 mi). Inclination: 65.80 deg. Period: 92.00 min. Released 25 Romb radar calibration subsatellites..
1989 February 14 - . 17:00 GMT - . Launch Site: Plesetsk. Launch Complex: Plesetsk LC132/2. LV Family: R-14. Launch Vehicle: Kosmos 11K65M. Cosmos 2002 - . Mass: 500 kg (1,100 lb). Nation: Russia. Agency: MO. Class: Surveillance. Type: Radar calibration target. Spacecraft Bus: AUOS. 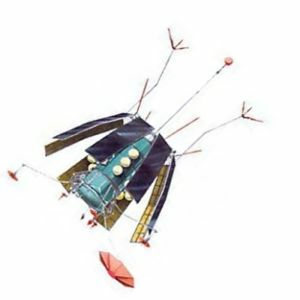 Spacecraft: Taifun-2. Decay Date: 1989-10-15 . USAF Sat Cat: 19800 . COSPAR: 1989-012A. Apogee: 1,525 km (947 mi). Perigee: 179 km (111 mi). Inclination: 65.80 deg. Period: 102.00 min. Released 10 Romb radar calibration subsatellites..
1990 February 6 - . 16:30 GMT - . Launch Site: Plesetsk. Launch Complex: Plesetsk LC132/2. LV Family: R-14. Launch Vehicle: Kosmos 11K65M. Cosmos 2059 - . Mass: 500 kg (1,100 lb). Nation: Russia. Agency: MO. Class: Surveillance. Type: Radar calibration target. Spacecraft Bus: AUOS. Spacecraft: Taifun-2. Decay Date: 1990-11-12 . USAF Sat Cat: 20476 . COSPAR: 1990-012A. Apogee: 1,585 km (984 mi). Perigee: 184 km (114 mi). Inclination: 65.80 deg. Period: 102.70 min. Released 10 Romb radar calibration subsatellites..
1990 April 25 - . 13:00 GMT - . Launch Site: Plesetsk. Launch Complex: Plesetsk LC132/2. LV Family: R-14. Launch Vehicle: Kosmos 11K65M. Cosmos 2075 - . Mass: 1,000 kg (2,200 lb). Nation: Russia. Agency: MO. Class: Surveillance. Type: Radar calibration target. Spacecraft Bus: AUOS. Spacecraft: Taifun-2. Decay Date: 1992-02-20 . USAF Sat Cat: 20581 . COSPAR: 1990-038A. Apogee: 439 km (272 mi). Perigee: 418 km (259 mi). Inclination: 74.00 deg. Period: 93.20 min. Released 25 Romb radar calibration subsatellites..
1990 November 28 - . 16:33 GMT - . Launch Site: Plesetsk. Launch Complex: Plesetsk LC32. Launch Pad: LC32/2. LV Family: R-36. Launch Vehicle: Tsiklon-3. Cosmos 2106 - . Payload: Tselina-D no. 69. Mass: 3,000 kg (6,600 lb). Nation: Russia. Agency: MO. Spacecraft Bus: AUOS. Spacecraft: Taifun-2. Decay Date: 2000-04-07 . USAF Sat Cat: 20966 . COSPAR: 1990-104A. Apogee: 469 km (291 mi). Perigee: 458 km (284 mi). Inclination: 82.50 deg. Period: 93.90 min. Released 27 Romb radar calibration subsatellites..
1991 June 25 - . Launch Site: Plesetsk. Launch Complex: Plesetsk LC132/1. LV Family: R-14. Launch Vehicle: Kosmos 11K65M. FAILURE: Second stage malfunction - no stable orbit.. Failed Stage: 2. 1995 March 2 - . 13:00 GMT - . Launch Site: Plesetsk. Launch Complex: Plesetsk LC132/1. LV Family: R-14. Launch Vehicle: Kosmos 11K65M. Cosmos 2306 - . Mass: 1,000 kg (2,200 lb). Nation: Russia. Agency: MO. Class: Surveillance. Type: Radar calibration target. Spacecraft Bus: AUOS. Spacecraft: Taifun-2. Decay Date: 2000-10-30 . USAF Sat Cat: 23501 . COSPAR: 1995-008A. Apogee: 513 km (318 mi). Perigee: 466 km (289 mi). Inclination: 65.80 deg. Period: 94.20 min. Released 25 Romb radar calibration subsatellites. Reentered on October 30, 2000..